The goal for many dental patients with crooked teeth is to find a convenient option that lets them smile with confidence. Whether you value treatment time, affordability, or comfort, advancements in orthodontics create an array of options to help you or your child achieve results with ease. Straight teeth benefit your oral health by eliminating opportunities for decay and fracturing to occur. At Dimitri Bizoumis, DDS, Inc., we provide traditional braces options, as well as Invisalign® clear aligners in Huntington Beach for patients of all ages. Call our office today to set up a consultation. For younger orthodontic patients, traditional metal braces provide efficient teeth straightening for their still-developing jaws. Children as young as eight can benefit from an orthodontic evaluation. After taking a precise account of your smile with digital impressions, the appropriate course of treatment can be determined. Children with fixed braces can expect regular monthly appointments to adjust the tension on the wires and conduct any necessary maintenance. Often, orthodontic elastic bands help further shift specific areas of the smile, while headgear can be added to treat irregularities. After the braces are removed, a retainer helps ensure the proper alignment stabilizes. The majority of orthodontic patients are children and teenagers, but more adults are seeking this cosmetic improvement. At your consultation, we answer your questions and concerns, determine the extent of treatment, and help you choose your most beneficial straightening option. More complicated cases may benefit from traditional braces, though improvements in Invisalign® clear aligners allow them to treat most orthodontic complications. Our office offers Invisalign clear aligners for a more discreet straightening option, so many of our patients seek this opportunity. We send you digital impressions to a lab so they can custom create your sets of aligner trays. Each set of aligner trays gently shift your teeth over the course of a few weeks, then replaced with next set in the progression. 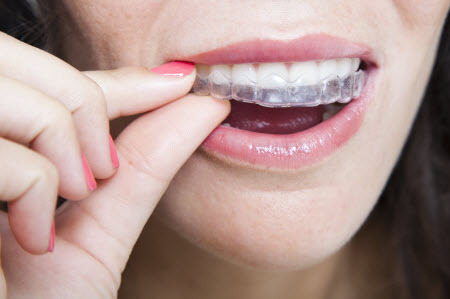 Not only are these clear aligners less noticeable, they are removable, allowing those wearing them to eat, speak, brush, and floss with comfort and ease. We also offer traditional braces for adults if they don’t want or wouldn’t benefit from Invisalign as a treatment option. At our practice, Dr. Bizoumis understands how a uniform smile can provide a great boost to a patient’s confidence. Our dedicated staff of professionals provide quality orthodontic treatment options in Huntington Beach that straighten your teeth efficiently. For more information, contact us today!